Van Gogh arrived in Arles in February 1888, the landscape covered with snow. But it was sun that he sought in Provence—a brilliant light that would wash out detail and simplify forms, reducing the world around him to the kinds of flat patterns he admired in Japanese woodblock prints. Arles, he said, was "the Japan of the South." Van Gogh's time in Arles was amazingly productive. In about 15 months—just 444 days—he produced more than 200 paintings, about 100 drawings, and wrote more than 200 letters. He described a series of seven studies of wheat fields: "landscapes, yellow—old gold—done quickly, quickly, quickly, and in a hurry just like the harvester who is silent under the blazing sun, intent only on the reaping." Yet he was also at pains to point out that these works should not be "criticized as hasty" since this "quick succession of canvases [was] quickly executed but calculated long beforehand." Pairs of complementary colors—the red and green of the plants, the woven highlights of oranges and blue in the fence, even the pink clouds that enliven the turquoise sky—shimmer and seem almost to vibrate against each other. The impressionists used this technique to enhance the luminosity of their pictures. Pissarro, who helped introduce Van Gogh to these concepts, noted, "if I didn't know how colors behaved from the researches of...scientists, we [the impressionists] would not have been able to pursue our study of light with so much confidence." Mme Johanna van Gogh-Bonger [1862-1925], the artist's sister-in-law, Amsterdam; sold 20 November 1890 through (Julien Tanguy Gallery, Paris) to (Willy Gretor [Wilhelm Rudolph Julius Petersen, 1868-1923], Paris); gift to Maria Slavona [1865-1931], Paris and Berlin; her husband Otto Ackermann [1871-1963], Paris and Berlin. Gaston Bernheim de Villers [1870-1953], Paris, by 1919 until at least 1933; sold to Capt. Edward H. Molyneux [1891-1974], Paris; sold 15 August 1955 to Ailsa Mellon Bruce [1901-1969], New York; bequest 1970 to NGA. Chris Stolwijk and Han Veenenbos, The account book of Theo van Gogh and Jo van Gogh-Bonger, Amsterdam and Leiden, 2002: 46, 140-141 note 11/5, 178. Regarding Willy Gretor's gifts of several van Goghs to the painter Maria Slovona, with whom he had a daughter Lilly, see Carmen Stonge, "Women and the Folkwang: Ida Gerhardi, Milly Steger, and Maria Slavona," Women's Art Journal 15, no. 1 (Spring/Summer 1994):7-8. The painting was published in 1919 in "Cent-soixante-treize planches d'après la collection privée de MM. J. & G. Bernheim-Jeune," L'Art Moderne et quelques aspects de l'art d'autrefois, vol. 1, 1919, pl. 65. Details about Gaston Bernheim de Villers' ownership and his sale of the painting to Molyneux are in a letter of 22 June 1977, from Jean Dauberville at Bernheim-Jeune & Cie. to David Rust, in NGA curatorial files. Although the painting was included in an exhibition at Reid and Lefevre in 1934, and a photograph album in their records includes the painting (with the names "M. Ackermann, Paris" and "Bernheim-Jeune, Paris" under provenance), it is not certain Reid and Lefevre actually owned it. More likely is the possibility that Molyneux purchased the painting from Bernheim de Villers out of the 1934 exhibition, with the sale handled by Bernheim-Jeune Gallery and/or Reid and Lefevre. (Martin Bailey has kindly shared his research on this part of the provenance; see his letter of 22 August 2003, in NGA curatorial files.) The sequence of ownership after Mme van Gogh-Bonger that is given by J.-B. de la Faille in The Works of Vincent van Gogh, His Paintings and Drawings, Amsterdam, 1970: no. F565, i.e., Bernheim-Jeune, Reid and Lefevre, Ackermann, Molyneux, is apparently in error. The purchase date is recorded in the Ailsa Mellon Bruce collection notebook, Gallery Archives, copy in NGA curatorial files. Vincent van Gogh, Bernheim-Jeune Gallery, Paris, 1901, possibly no. 16, Mas en Provence (1888). Tentoonstelling van Schilderijen en teekeningen door van Gogh, Stedelijk Museum, Amsterdam, 1905, no. 111. L'Epoque française de van Gogh, Galerie Bernheim-Jeune, Paris, 1927, no cat. Renoir, Cezanne, and Their Contemporaries, Alex. Reid and Lefevre, Ltd. (The Lefevre Galleries), London, 1934, no. 21, Entrée d'une ferme aux environs d'Arles. French Paintings from the Molyneux Collection, National Gallery of Art, Washington, D.C.; Museum of Modern Art, New York, 1952, unnumbered checklist, repro. Vincent Van Gogh in Arles, The Metropolitan Museum of Art, New York, 1984, no. 44, repro. Capolavori Impressionisti dei Musei Americani, Museo e Gallerie Nazionali di Capodimonte, Naples; Pinacoteca di Brera, Milan, 1986-1987, no. 21, repro. 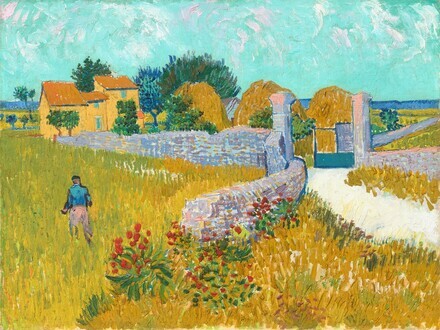 Van Gogh et Arles, Hôpital Van Gogh, Arles, 1989. From El Greco to Cézanne: Masterpieces of European Painting from the National Gallery of Art, Washington, and The Metroplitan Museum of Art, New York, National Gallery of Greece, Athens, 1992-1993, no. 69, repro. Van Gogh: His Sources, Genius and Influence, National Gallery of Victoria, Melbourne; Queensland Art Gallery, Brisbane, 1993-1994, no. 39, repro. Masterpieces from the National Gallery of Art, Washington, Kyoto Municipal Museum of Art; Tokyo Metropolitan Art Museum, 1999, no. 57, repro. Van Gogh and Gauguin: The Studio of the South, The Art Institute of Chicago; Van Gogh Museum, Amsterdam, 2001-2002, no. 56, repro. Van Gogh: Felder. Das 'Mohnfeld' und der Künstlerstreit (Van Gogh: Fields. The 'Poppy Field' and the Artist's Debate), Kunsthalle Bremen; The Toledo (Ohio) Museum of Art, 2002-2003, no. 39 (Bremen catalogue), no. 10 (Toledo catalogue), repros. Van Gogh and Britain: Pioneer Collectors, The Dean Gallery, Edinburgh, 2006. Van Gogh in Budapest, Szépmüvészeti Múzeum, Budapest, 2006-2007, no. 54, repro. Vincent van Gogh - Between Heaven and Earth: The Landscapes, Kunstmuseum Basel, 2009, no. 35, repro. Impressionist and Post-Impressionist Masterpieces from the National Gallery of Art, The Museum of Fine Arts, Houston; The National Art Center, Tokyo; Kyoto Municipal Museum of Art, 2011, no. 19, repro. Van Gogh: Up Close, Philadelphia Museum of Art; National Gallery of Canada, Ottawa, 2012, unnumbered catalogue, ill. 163. Becoming van Gogh, Denver Art Museum, 2013, no. 80, repro. Van Gogh Repetitions, The Phillips Collection, Washington; The Cleveland Museum of Art, 2013-2014, no. 8, repro. Van Gogh and Nature, Clark Art Institute, Williamstown, MA, 2015, no. 27, repro. Duret, Théodore. Van Gogh, Vincent. Paris, 1916: repro. pl. 26. L'Art Moderne et quelques aspects de l'art d'autrefois. Paris, Bernheim-Jeune, 1919:65, repro. Faille, J.-B. de la. L'Oeuvre de Vincent Van Gogh, catalogue raisonné. 4 vols. Paris and Brussels, 1928: 1:no. 565; 2:repro. Scherjon, W. and Jos. de Gruyter. Vincent van Gogh's Great Period: Arles, St. Rémy and Auvers sur Oise (Complete Catalogue). Amsterdam, 1937:187, no. 170, repro. Faille, J.-B. de la. Vincent Van Gogh. New York and Paris, 1939: 381, no. 565, repro. Frankfurter, A.M. "The Molyneux Collection travels." Art News 51, no. 2 (April 1952):34. French Paintings from the Collections of Mr. and Mrs. Paul Mellon and Mrs. Mellon Bruce. Exh. cat. National Gallery of Art, Washington, 1966: repro. no. 131. Roskill, Mark. "Van Gogh's 'Blue Cart' and His Creative Process." Oud Holland 81, no. 1 (1966): 5. Faille, J.-B. de la. The Works of Vincent van Gogh: Paintings and Drawings. Amsterdam, 1970: no. F565, repro. Roskill, Mark. “Van Gogh’s Exchanges of Work with Emile Bernard in 1888.” Oud Holland 86, no. 2/3 (1971): 170. European Paintings: An Illustrated Summary Catalogue. National Gallery of Art, Washington, 1975: 156, repro. Walker, John. National Gallery of Art, Washington. New York, 1975: repro. 525. Small French Paintings from the Bequest of Ailsa Mellon Bruce. Exh. cat. National Gallery of Art, Washington, D.C., 1978: 76, repro. (continuing exhibition beginning in 1978). Hulsker, Jan. The Complete Van Gogh. New York, 1980: 324-6, no. 1443, repro. Walker, John. National Gallery of Art, Washington. Rev. ed. New York, 1984: 520, no. 781, color repro. European Paintings: An Illustrated Catalogue. National Gallery of Art, Washington, 1985: 180, repro. Wolk, Johannes van der, Ronald Pickvance, et al. Vincent van Gogh: Drawings. Translated by J.W. Watson. Exh. cat. Rijksmuseum Kröller-Müller, Otterlo. Milan and Rome, 1990: 234. Coman, Florence E. Joie de Vivre: French Paintings from the National Gallery of Art. Washington, 1991: no. 27, repro. Walther, Ingo F., and Rainer Metzger. Vincent van Gogh: Sämtliche Gemälde. 2 vols. Cologne, 1994: 2:368. Dorn, Roland. “‘Refiler à Saintes-Maries’? Pickvance and Hulsker Revisited.” Van Gogh Museum Journal (1997–1998): 20, repro. 21. Hulsker, Jan. “Facts Instead of Suppositions: Roland Dorn Revisited.” Van Gogh Museum Journal (1999): 24–28. Stolwijk, Chris, and Han Veenenbos. The account book of Theo van Gogh and Jo van Gogh-Bonger. Amsterdam and Leiden, 2002: 46 (11/5), 140-141, 178 no. F565 JH 1443. Ives, Colta, et al. Vincent van Gogh: The Drawings. Exh. cat. The Metropolitan Museum of Art, New York. New Haven, 2005: 200, repro. Skea, Ralph. Vincent's Gardens: Paintings and Drawings by Van Gogh. New York, 2011: 71, no. 45, color repro. Rathbone, Eliza E., William H. Robinson, Elizabeth Steele, and Marcia Steele. Van Gogh Repetitions. Exh. cat. The Phillips Collection, Washington; Cleveland Museum of Art. New Haven and London, 2013: repro. (detail) 58, 59, repro. 60.